This is an ophthalmologist malpractice case filed in Baltimore City by a man residing in New Jersey. This case was filed in Health Claims Arbitration on January 4, 2017. It is the second medical malpractice case filed in 2017 in Maryland. Burley v. Western Maryland Eye Center: an ophthalmologist malpractice lawsuit filed in 2017 by a Frederick County woman alleging the doctor failed to properly perform an exchange implant surgery. 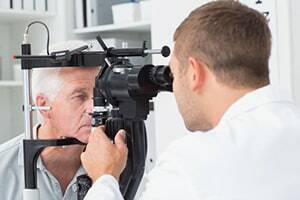 Plaintiff is a 64-year-old male with a history of double vision. He has been diagnosed with divergence insufficiency (meaning his eyes point in the same direction). Plaintiff consults with the defendant doctor to discuss treatment options, and the defendant doctor recommends surgery. The eye surgery is performed. However, plaintiff alleges that during the procedure, the defendant doctor improperly placed sutures in his left eye that come loose and caused a divot in the sclera (the white part of the eye). Defendant doctor then performs a second procedure to retrieve the sutures, but he again improperly utilizes the wrong tool for the repair. While performing the corrective procedure, he lacerates the plaintiff's sclera with a tool and damages the retina. After failing to repair these issues, he calls for an evaluation by a retina specialist who finds retinal tears with subretinal fluid and hemorrhage. As a result of this, the plaintiff no longer has vision and is permanently disabled. He faces substantial extraordinary medical and care expenses. Divergence insufficiency is considered a supranuclear palsy. The supranuclear eye movements are involved in keeping our eyes in proper position. The human visual system has to alternate quickly between convergence and divergence to properly focus on targets of different distances. In patients with divergence insufficiency, the patient cannot focus on objects and have poor depth perception. The problem is distance or near depending on which deficiency they manifest. In divergence insufficiency, the patients will often have difficulty with distance vision or double vision at a distance though not at near. This can be managed with prism in glasses, but without the prism the patient will have double vision. The defendant doctor is an older doctor with a resume as long as your arm. The Wilmer Eye Institute is world renowned and Baltimore jurors know it. Given these facts, the liability case needs to be very strong for the plaintiff to overcome the halo effect of this doctor and this medical facility. Medical malpractice lawsuits against ophthalmologists are not particularly common. This is not because they do not commit malpractice but because they are generally hard to prove. Have you or a loved one suffered and you suspect the negligence of a doctor, nurse or hospital? Miller & Zois can help you get the justice and compensation for the harm you have endured. We have a long history of results in medical malpractice cases in Maryland. Call us today at 800-553-8082 to speak with a caring attorney or get a free online case review. Did you suffer an injury during surgery? What could go wrong after Lasix eye surgery?